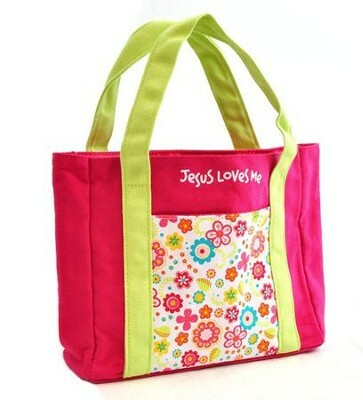 Just the right size for little girls, our canvas tote in fuchsia features contemporary floral pattern with lime green handles and message Jesus Loves Me. 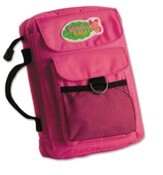 Features exterior pockets and lined interior with two more pouch pockets. Measures 9" x 7.75" x 2.5" with 5" handles. 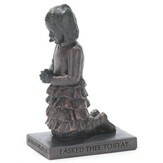 A fun and contemporary bag for young girls to carry their Bible and other desired items to church. Features an exterior pocket with printed fabric material, small interior pocket, and large interior pocket to fit a Bible and other items. Made of a durable canvas material with coordinating floral fabric. I'm the author/artist and I want to review My First Church Bag.